Successfully Added Tactical Red and Green Dot Reflex / Reflector Gun Sight (11mm Rail Mount) to your Shopping Cart. Designed for any firearm with an 11mm mount, this Tactical Red and Green Dot Reflex / Reflector Gun Sight is unrivaled in both speed of target acquisition and accuracy. This excellent gun accessory is here and ready to help make your every shot count. Made of hard anodized, high strength aluminum, this tactical gun sight has been designed to be resistant, durable, and last through the ages. It fits most pistols through a 11mm rail mount and can be easily attached/unattached with the included Allen wrench. After that, you have yourself the perfect gun accessory to make your shots more accurate than ever. Why red and green? Red is more clear during day and green is more visible to the eyes at night or in low lighting areas. 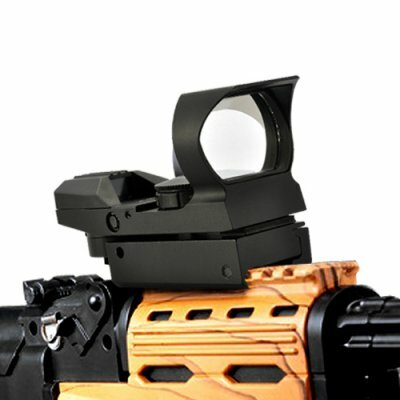 That makes this gun sight ideal for use at any time and any location. Switching between colors is just a simple matter of turning the knob in the middle, which will also let you switch between multiple brightness levels of each color as well. Why this gun sight? Simply put, easy, accurate, and fast aiming without the target being alerted. Just look inside the scope and you'll find a dot for accurate bullet positioning, increasing accuracy and improving target acquisition time. That makes this gun sight ideal for hunting, covert operations, and even in the middle of intense gun fights where every millisecond counts. Whether you need this one for yourself or plan on reselling it in your online store, this Tactical Red and Green Dot Reflex / Reflector Gun Sight is the ideal choice. In our warehouse right now, order yours today and we will ship it out tomorrow. Brought to you by Chinavasion.